Giving Credit Where Credit is Due: Good Job Satan! Every so often, there is someone that makes a mark…that does/says/institutes something that effects the way society runs, the way that people interact, the way that we view the world. Some of these people are recognized by awards…Nobel Peace Prize, for example. Some are forever immortalized, good or bad, in our History Books-Mother Theresa & Hitler, just to name a few. The point is, it is within the makeup of our race to recognize notable contribution. It’s become such a common expectation that it is now immortalized in slang—“You Better Recognize”. So, I decided today, to recognize one of the greatest masterminds/contributors this world has ever seen…. No, I didn’t mean to type Santa, and no, you didn’t mis-read. I meant to put Satan. Lucifer: The Prince of Darkness, esquire. I mean, you gotta hand it to Evil Bro—he’s had some pretty impressive strategies and impacts on every culture, worldwide. Take the removal and subsequent demonization of Fathers in most societies. Fathers have, since the beginning of time, provided covering, identity and purpose. They were set up that way, to reflect the defining Fatherhood of God. Soooo, to dim the reality, the glasses which we view God through have to be fogged. The effect of taking Dad out…duh duh dunnnnnn…our image of God, like it or not, now is tainted. Ohhh, or Divorce! Another brilliant play by the accuser of the breather. Broken fellowship, broken covenant, broken heart. Once we are weighed down by a perverted brand of brokenness, we tend to lose sight of the beauty that comes from a broken and contrite spirit. If the most binding type of covenant we know can be easily dissolved, if people can fall in and out of love…how can an eternal Covenant with someone we can’t see hope to last through our shortcomings, failures and infidelities? How can we trust that God is keeping up his end when we don’t even have confidence in our own commitment? Another great contribution: Greed. Just a tweak or two here of the promise of being fulfilled in God, and now we can trust ourselves to find satisfaction apart from his Presence. After all, it’s easier running after things we can see and feel than running after someone we can’t. So, yes, today, I am giving MAD PROPS to Satan for his clever, calculating-albeit unoriginal-corrupting of God’s plan. And as believers, we HAD BETTER RECOGNIZE! I’m not trying to make the Devil out to be anything bigger than the most futile individual (I mean really, who contends with God for so long and still has hopes of winning…only a very delusional, very sad being) than he is. He’s not the opposite of God, he’s not God’s nemesis (that would imply there is actually some clash or opportunity for a fight….and if I recall correctly, he’s was thrown from Heaven, not backed down or forced to retreat…thrown forcibly). But if we fail to recognize the marks he’s left and the snares he’s put out, we are upping his status to Contender, as opposed to the actual Defeated Status he has. There are a reason these tactics have been so successful, and I really think it comes from a lack of recognition. Let’s guard our hearts. Dad’s…be dad’s, you’ve been given an amazing position that others don’t have…to be a reflection of Father God to your children. How you steward that will help shape how they view their Heavenly Daddy. Husbands/Wives…you also are carrying an important word picture that the World needs to see intact. Love each other as Christ loves the church; submit to each other and pursue one another with the same dedication you would want to be pursued with. Don’t give up on each other. And to all believers, seek satisfaction in God…let his presence be the fullest reward this world will ever see. Don’t be a tool in the hands of defeated foe, but be a light held in grasp of a Victorious Warrior, inviting those stumbling off the battle field to their intended Haven. Sorry this one is so long, and obviously this isn’t the complete resume of the Devil-imagine how much longer it would have been. But that’s where you come in…what are some other tactics that we should RECOGNIZE? Jump in! What do the Church and PeopleofWalmart.com Have In Common? Don’t lie, we’ve all been to this site…PeopleofWalmart.com. If you haven’t, well, you probably don’t spend much time on the internet. I’m not going to lie, at some point, this site will probably make you laugh. For those fortunate enough to be undefiled, let me summarize. Have you ever been at Wal-mart and glimpsed someone who was a little less than put together? Or maybe they are dressed in just an outright bizarre manner. Whether is it is Ghetto-stereotypical, White-Trash Wacky or Granny, your granddaughter called and wants her wardrobe back, we’ve seen them. If you’ve read this paragraph so far and are asking yourself…Why don’t I ever get to behold the spectacle of crazy at Wal-Mart? Look no further: (drum roll) peopleofwalmart.com is here to save the day. Now, you don’t have to be present to win…you can gleefully mock, ridicule, chuckle, make snide comments or shocked faces without fear of being detected…all from the comfort of your rolling desk chair or your smart phone. I’ll be honest…I have visited this site, of my own volition, out of boredom and then sent a link to someone. But it hit me one day…how mean is this? I mean, who of us has not made the late night run to Wal-Mart for snacks/diapers/feminine products/milk/etc. in our P.J.’s? Or who hasn’t run out last minute to Kroger/Albertsons/Vons in the clothes you were cleaning the house in to grab some ice or a sweet treat after hard work? We won’t even get started on the bold Red Box wardrobe. Why isn’t there a PeopleofHomeDepot.com? People go there splattered with paint and grease and stucco all the time. We’ve all graced the public eye in a not so graceful way at one point or another. Most of us would be shocked and hurt to find our picture on a site, ready for public ridicule. It’s human nature to be uncomfortable and feel betrayed at being exposed. 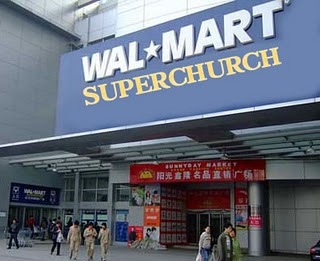 Circling back to our initial question, what do the Church and PeopleofWalmart.com have in common? Do I need to spell it out? Gossip and exposure in the Church are like a cancer. It’s subtle and many people don’t even realize that they are suffering from it until it is too late to deal with apart from painful measures. Who hasn’t ever heard a choice piece of information passed on under the guise of a prayer request? 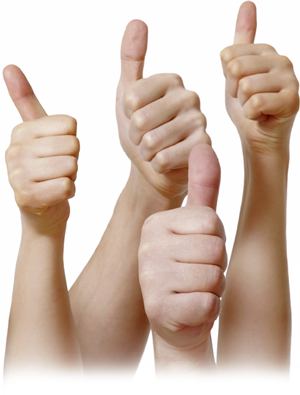 Who hasn’t read people’s frustration at the complacency/judgmental-ness/lack of passion/etc voiced on someone’s blog? Sure, names might not be mentioned, but someone’s laundry is out there now, super hero undies and all, blowing in the wind mustered by the rapid clicks and re-tweets. Do we buy into it? Do we ever. Ok, everyone, close your eyes so no one feels embarrassed and raise your hand if you can admit you are more likely to click on something with a sensational title…someone’s confessing something, exposing something…anything that promises to be surprising and unexpected? We like the sensation. We like knowing. And we like, sad as it is, to feel better about our *itty* dysfunction when compared to someone else’s BIG issue. And all the while, the world is watching. Think back…how would the world/news/media know when a preacher has fallen if not for the fact that Christians are talking? How does it sound to a non-believer when a Baptist preacher mocks those “Snake Handlers” down the street or the Charismatic Pastor comments on this churching being “as quiet as a Baptist Church”? Reliant K has a song titled “Down in Flames” that sums it up great… “We’re cannibals, we watch our brothers fall, we eat our own, the bones and all.” Friends, can’t we all just get along? Why do we have to slander something else to make ourselves look or feel good? Love covers. And I don’t mean this in a hiding sense, but in the ‘you expect the mean girl at school to expose the fact that you slept with someone, not your brother or sister’ kind of way. So, here’s to the abolishment of not just PeopleofChurch.com (I really hope there isn’t such a site), but the PeopleofChurch mentality. How would the Church at large look/be received if instead of opening the shower curtain covering a dirty church, we snapped shots of service, sounded the alarm on hands being reached out in True Religion, serving the orphan and the widow? Let’s start letting our love for one another be the credibility in our creed and stop using our fallen brother as a means of a leg up. Why do you think this attitude is so prevalent in the American Culture? How can we practically take steps to ending it in our own lives? Anything else you want to share? I know this isn’t the previously mentioned posts that were coming up, but today I received a challenge and I want to share it. Sammy Adebiyi asked his readers today to describe their relationship with God in a word…yes, one word, but thankfully, he allowed for explanation. I challenge everyone to check it out here and then rock the exercise for yourself. Today’s post is an extension of my response to his post. Describe your relationship with God in ONE WORD. Yes, like the breakfast food. If you are from America, I guarantee you can draw an association between God and food (even if you suffer from an eating disorder). You see, yesterday morning, a co-worker brought in bagels from Panera (Uncle Harry’s in Fresno is better, but Panera is decent). I had one and it was pretty good (the asiago kind). This morning, I decided to grab one of the left over’s, preferring it to my stock oatmeal. I had packed up the left over bagels at lunch yesterday and I knew there was one more Asiago bagel left. Upon entering the break room, I was sad to discover my hoped for Asiago was otherwise engaged (probably being digested in someone else’s stomach), so I grabbed a cinnamon raisin (or so I thought). It was still pretty good, but not as good as yesterday, when it was fresh. And, after a few bites, I realized it didn’t taste like cinnamon raisin should. I realized it was chocolate chip…I was nearly half of the way through before I realized it was not what I thought it was. Don’t ask me how one confuses Cinnamon Raisin and Chocolate Chip, but I did. And then, I was kind of sad because it wasn’t what I wanted. It wasn’t even the second runner up. 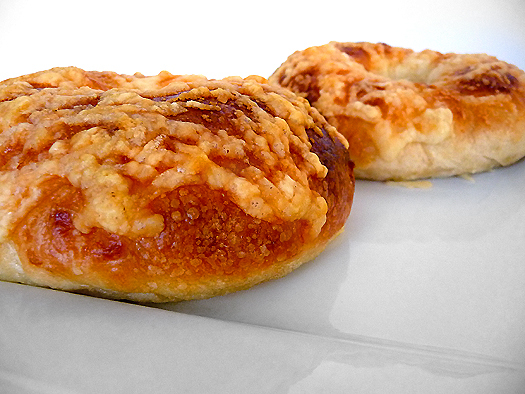 Even the picture of a bagel offers explanation…it looks whole from the outside, but at the center, something is missing. As I was reading Sammy’s post, all I could think of was that’s how my relationship with the Lord is right now…It was like the bagel I was eating. It’s still ok, but it’s more like left over’s than something fresh; and I choose it because it’s better than the alternative. Plus, it’s free and right there…I don’t have to go look for it, I don’t have to be inconvenienced to have it. I am not doing it/having it because it is something I crave, but because it’s convenient. If it isn’t, I’m probably not partaking. I’m not as sensitive as I need to be. It’s usually going to take a ridiculous amount of time before I realize what’s in front of me. It’s not hard yet, but it is less soft than yesterday and it will only get worse with time. When you put that all together, it is less than fulfilling than I want it to be. As if comparing a relationship with God to breakfast weren’t bad enough, it’s not even a good breakfast. Today, that’s hurting my heart. I want my relationship with God to be like my Starbucks this morning. I woke up thinking I have to have that this morning or I am screwed. It’s the thing I put thought into ordering, taking time to get it right and I won’t just take whatever. I was tired, but you know what that means…time for a Vinti. That’s right…the more tired I am, the more of it I need. Also, it costs me something…and I am willing to pay the price. There’s not a time that I go that I’m like ehh, what’s $4.50 between friends. No, I determine it’s something I value and I go and get it. And I will go and get it, to be sure. Even if I have to get up 10 minutes earlier so I can leave in time to stop, if I want it, I will make the adjustment to fit it in. I want to crave Jesus and my time with him like that. I don’t want to treat God like a two day old bagel…and not even a good one at that. Thoughts? Here’s the exercise for today: What’s a word picture you can paint to show yourself just where your relationship with God is? I knew I wasn’t where I wanted to be, but looking at it like this today, I’m sad, but I want more. Anyway, some good stuff is coming down the pike, look forward to it. Over the next week, we will be exlporing everything from How Church is Like PeopleOfWalMart.com and the book, Blue Like Jazz and the funeral of the most awesome Blue Shoes ever.